This is plate 12 from James Fergusson's 'Illustrations of the Rock Cut Temples of India'. Fergusson used a print by Henry Salt as a template for this view. 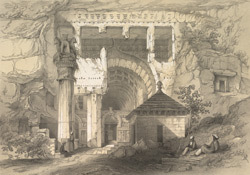 The 16 caves at Karli in Maharashtra were part of the great wave of early rock-cut architecture in India. The Great Chaitya or prayer hall at Karli is a key Buddhist archetype. It is entered via a courtyard, in which stands a huge 'simhastambha': a column bearing an inscription and a bell-shaped capital topped by four lions. The only comparable column is at Kanheri. The cave porch is adorned with some of the finest carvings of ancient India, including depictions of 'mithunas' (couples). The facade of the cave has a wide horseshoe-shaped window. Inside the hall the nave and aisles are separated by collonades, and there is a large Buddhist monument known as a dagoba or stupa. The cave sculpture dates from some time between the first century BC and the first century AD. The Satavahana dynasty helped support the Karli caves and the monks who inhabited them.